“If you step on my toes again, I’m going to POP you.” I snarled at Ralph. “I’m trying to do you a favor here! Tell me again, just why did you ask Sheila out to a club when you have two left feet?” I rolled my eyes in disbelief. The tips of Ralph’s ears turned pink as he blushed. His curly red hair stuck up in all directions. His dark freckles stood out against his milk-pale skin. “Sheila loves to dance.” He mumbled. We shuffled around the floor while Sting crooned in the background. “If you breathe one word about this to anybody!” I said threateningly. Blowing my black bangs away from my eyes as Ralph swung me about energetically, almost slamming me into the wall. “Watch where we’re going you moron!” I snapped. “Sorry!” He gasped. “I promise that I won’t tell.” Ralph swore as sweat rolled down his face. The disc changer worked its magic. The beat picked up and Savage Garden began belting out AFFIRMATION. “You’re a true pal.” Ralph panted. Linkin Park thundered the lyrics to IRIDESCENT. Ralph jerked and twitched like a strung out junkie. “All right, that’s enough for today.” I announced. “Thank God that’s over!” Ralph collapsed red-faced, sopping wet and gasping. “That’s a great idea Charley.” He said pushing himself up and stumbling for the Men’s locker room while I entered the door of the Women’s. 499 Words in response to Finish That Thought #2-20, Special Challenge: Include at least three (3) one-word song titles. Highlight them so he can find them. eg, make them ALL CAPS or bold. And initiate some life-style changes. The first time you hear their screams is always the hardest. It hurts your soul deep inside where no one else can see it, leaving scar tissue behind. It begins when you are an Apprentice, only fourteen years old and have just taken your draught of Dragon’s Blood, so thick, dark black and vile tasting, which lets you hear the voices of all the plants and all the animals. It’s the first time your Master directs you to perform the deed. You will always remember the way they begged and pled for mercy and their lives. How they squirmed and twisted in the hard grasp of your hands as you raised the razor-edged silver athame, claiming them. The days elapse and you become inured to it. Months turn into years and you begin to take a dark, twisted pleasure in their sacrifice. You turn into a fiend. You anticipate the ocassion, waiting impatiently. You plot and plan from the end of one season to the beginning of another. You ruthlessly weed out the weak and inferior, picking out your Chosen, taking only the biggest, the best, and the brightest. You turn it into a ritual. You take pride in the precsion of each stab and every slice, expressing your individuality, your style, your artistry. You experiment with spices, adding a pinch of cinnamon, a dash of ginger, a sprinkle of nutmeg ,or a smidgeon of ground cloves. You make it into a competition. How many can you complete in an hour, a day, or a week? How exotic, bizzare, or extreme can you make them? You study and practice relentlessly, seeking to become first better, then best, and finally infamous. It consumes your being, driving your every thought, action, and mood. It is your be all and end all. Until all that exist is the Harvest. That’s the big downside to being a Cooking Wizard, when it comes time to reap your living pumpkinpatch, carve out your Jack’O Lanterns and make your holiday pies. 333 Words in response to Finish That Thought #2-18, Special Challenge: Include at lease THREE spices. Pure bliss filled my soul. Swear to set your soul free. Winter Lingers Five Months Long. There’s one thing they really should teach you in skydiving school. Which is what to do when your tandem partner, who is in control of the parachute, misjudges your landing zone, coming down hard in the middle of a busy six-lane highway, knocking the wind out of you, almost getting you creamed by an Isuzu Trooper and winding up looking like a plate of squished spaghetti! It missed me by inches, I felt it’s body brush against my hair! There is some truth in the clichés about your life flashing in front of your eyes, it happened to me, and it was much, much too short! My name is Bob, my partner, Frank and I have been together for over seven years, we went everywhere and did everything together, until that is, that fateful day. Frank panicked and froze in the face of the danger. He hit the harness release and ran for it, leaving me trembling and helpless, alone in the middle of the street! The only reason that I didn’t get turned into roadkill is that a gorgeous transvestite dressed up as Carmen Electra stopped to help me. He slammed on his brakes, skidded to a stop, lunged out of a fire-engine red Ferrari, scooped me up securely in his strong manly arms and carried me away to safety on the shoulder. He also yelled at Frank about forgetting to grab me. I broke up with Frank because of the incident, I just can’t trust him anymore. I’ve been living with Carmen/Carl for the last six months and we’re very happy together. I have complete faith in him. There is one drawback, however, because of the trauma I suffered I’ve had to start seeing a shrink. I’m having anxiety attacks, experiencing nightmares, and am feeling depressed because I’m completely unable to perform one of my favorite activities. How would you feel about not doing something you enjoyed and were really good at? I used to love chasing cars, but now in my sleep, they chase after me! 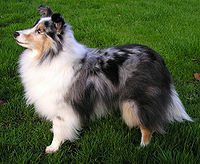 The image of that silver behemoth of an SUV barreling down on me will haunt me to the end of my days, which is ironic really, considering that I’m a Shetland Sheepdog. At the Ice Bucket Challenge.